As much as banner advertising has proved to become extremely profitable for some advertisers, I still believe (along with the majority) that pay per click advertising is the best form of advertisement online. Saying this, banner advertising comes respectably second. Even though it is not the number one best form of advertisement online, this doesn’t mean that it won’t make you money. Banner advertising has been around much longer than PPC seeing that PPC was first created by Google back in 2000 with Adwords. Due to this, banner advertising has been perfected and tweaked over the years to make it a good competitor to PPC. 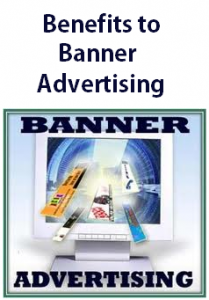 Here are some of the main strong points to banner advertising you will benefit from. This can be seen to apply for both advertisers and publishers. Before you start your banner advertising campaign, you already know the running costs of the campaign because you pay one fixed fee for a certain amount of days of advertising. This means you can plan much further into the future. Even though you can budget with PPC, there is still an element of risk involved with how many clicks you get each day. One day, you may get hundreds of thousands of clicks when on other days you get nothing. With PPC, your operational cost will fluctuate with your clicks. With banner advertising, it won’t. Simple. With pay per click advertising, you choose keywords which Google try to relate to the publisher’s websites you are advertising on. However, the chances are that the majority of the time, you are not advertising on exactly the right website for your campaign. It may be linked to the same topic as your campaign. However, it may not provide optimum results. With banner advertising, you choose the exact website you want to advertise on. This means that your advert gets the traffic you want and your campaign wants ideally for the highest rate of success. PPC is contextual. However, with banner advertising letting you choose the exact website to advertise with, it can be considered that this form of advertising is more than contextual. It is tailor-fitted. As I have already said, a PPC campaign’s cost is directly linked to its performance. The more clicks, the more money it will cost you. This is not the case with banner advertising. You pay for a certain number of days advertising on a website. Therefore, if the website you are advertising on has a sudden surge in traffic, you don’t get charged for this but instead benefit from it. From this, chose wisely who you choose to advertise with. Choosing a website that is looking to have a surge in traffic can provide much success for your advertising campaign.